dairy | Be Healthy Now! Imagine for a moment an isolated village surrounded by mountains. The only food and water source comes directly from the land that is bordered by these mountains. There are no paved roads, no hospitals, no dentists, no doctors, and no electricity. There are also no modern health foods (low calorie, reduced fat, raw kale chips, smoothies, zero-calorie sugar, soy-based meat, milk & cheese substitutes), and not even tooth brushes! Such a place once existed, in the Lötschental Valley, located in the Burnese Alps of Switzerland. In 1931 when Dr. Weston A. Price first visited, the Lötschental Valley was nearly inaccessible. It is almost a mile above sea level and surrounded by steep mountains. Due to their remoteness, the villagers were completely isolated and were fully dependent on what they could harvest and produce for themselves. Everyone in the village would work to help out, and such skills were taught to children as part of their general education in school. Like other traditional cultures that endure long and cold winters, the villagers of Lötschental Valley relied on animal products to sustain them. Staples of the villagers diet were raw milk, raw butter, raw cheese, raw cream, and sourdough rye bread. A typical lunch children would eat was a swiss cheese sandwich which had two very thick slices of soured rye sandwiching an almost equally thick slice of raw swiss cheese. From Dr. Siegen, I learned much about the life and customs of these people. 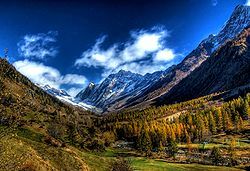 He told me that they recognize the presence of Divinity in the life-giving qualities of the butter made in June when the cows have arrived for pasturage near the glaciers. He gathers the people together to thank the kind Father for the evidence of his Being in the life-giving qualities of butter and cheese made when the cows eat the grass near the snow line. This worshipful program includes the lighting of a wick in a bowl of the first butter made after the cows have reached the luscious summer pasturage. This wick is permitted to burn in a special sanctuary built for the purpose. The natives of the valley are able to recognize the superior quality of their June butter, and, without knowing exactly why, pay it due homage. Generally when Dr. Price was visiting a village, he would send samples foodstuff back to his lab in Ohio for testing. In his book, Dr. Price mentions how the cattle’s hay that he had tested was “far above the average in quality” for such feed. This in turn means that the nutritional quality of the products that came from these animals was superior in nature and highly nutrient dense. Being so far above sea level in the mountains of Switzerland meant that the villagers of Lötschental Valley had a very short growing period for any produce. This means that their diet relied heavily on their storage crop of rye as well as various forms of dairy for daily sustenance. This flies in the face of conventional nutritional guidelines that suggest to consume a diet of 50% or more of plants (or the staunch suggestions by members of the PCRM that ones diet must include 90% or more of plants or face disease). Sheep’s meat was eaten once a week by the villagers, and the bones then were used to make mineral-rich stock which would be used in other dishes and for soup throughout the week. During special athletic performances, athletes were fed bowls of cream and special, mineral-rich cheese. Despite a diet high in (mostly saturated) fat, mainly from dairy, and very little fruits and vegetables, the villagers of Lötschental Valley were of superb health. When Dr. Price came to Lötschental Valley, the first thing he did was examine the teeth of everyone in the village. 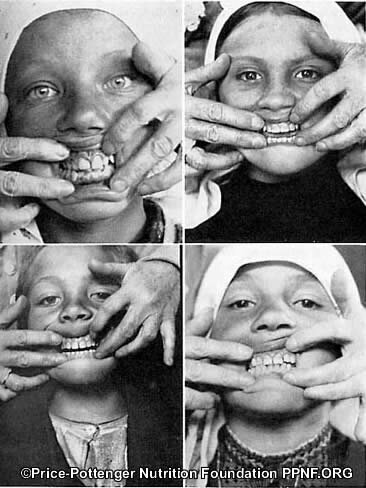 The reader will scarcely believe it possible that such marked differences in facial form, in the shape of the dental arches, and in the health condition of the teeth as are to be noted when passing from the highly modernized lower valleys and plains country in Switzerland to the isolated high valleys can exist. Fig. 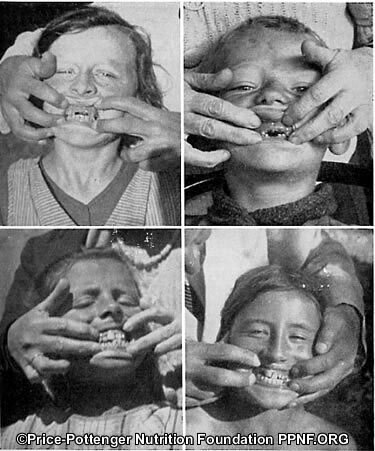 3 shows four girls with typically broad dental arches and regular arrangement of the teeth. They have been born and raised in the Lötschental Valley or other isolated valleys of Switzerland which provide the excellent nutrition that we have been reviewing. They have been taught little regarding the use of tooth brushes. Their teeth have typical deposits of unscrubbed mouths; yet they are almost completely free from dental caries, as are the other individuals of the group they represent. In a study of 4,280 teeth of the children of these high valleys, only 3.4 per cent were found to have been attacked by tooth decay. This is in striking contrast to conditions found in the modernized sections using the modern foods. During this period of time in Switzerland, tuberculosis was a major problem. Raw milk has been blamed at times for contributing to this pandemic, but government officials told Dr. Price that there were no recorded cases of TB in the Valley, ever. The people living there were so hardy that children would actually play in the freezing cold rivers (which were created from glacial runoff) barefoot and bareheaded, right in the middle of winter. While in Switzerland, Dr. Price inquired about other areas that contained isolated populations. In the village of Grächen, Dr. Price notes coming across a 62 year old woman who was carrying an enormous load of rye on her back at an altitude of about 5,000 feet. He continues, mentioning that he and his assistants and translators met her later and talked to her, and found that she was extraordinarily well developed and well preserved, as were her grandchildren who had fine physiques and facial developments. Life and diet was very similar in all the isolated villages that Dr. Price visited. He continually notes that all the Swiss villagers were strong, sturdy, and had fine endurance. These people had no tractors, nor even employed animal labor. Bushels of rye, as well as the enormous loaves of rye bread (a month’s supply was baked at a time), were carried by hand and likewise the rye itself was thrashed by hand. All of the villagers had exceptional athletes that were fantastic mountaineers as well. An argument often made in Dr. Price’s time was that certain villages had perfect teeth because of genetics. However, this is simply not true. When Dr. Price visited modernized towns in Switzerland, their health was completely different. Their teeth were ravaged with decay, their bodies frail, and their immune systems were weak. there were three children whose teeth were much better. Dr. Price then analyzed their diet and they seemed to eat similarly to their traditional diet with liberal amounts of milk and dark bread. The diet of the other children was largely that of white bread and no milk. Since so many cattle were stall-fed in the thickly populated part of Switzerland, and since so low a proportion of the children used milk even sparingly, I was concerned to know what use was made of the milk. Numerous road signs announcing the brand of sweetened milk chocolate made in the several districts suggested one use. This chocolate is one of the important products for export and as a beverage constitutes a considerable item in the nutrition of large numbers living in this and in other countries. It is recognized as a high source of energy, primarily because of the sugar and chocolate which when combined with the milk greatly reduces the ratio of the minerals to the energy factors as expressed in calories. It is amazing how the Swiss villagers of Lötschental Valley and other isolated towns were fit and healthy despite not following what we are told today is a necessary diet. As I had mentioned before, no foods that were reduced in fat, nothing low in calories, and yet they were in great health. Dr. Price called the foods of these industrialized diets the “displacing foods of modern commerce”. Indeed, it is in the name of commerce that foods like white bread have been brought in and eventually ruined the diet, and health, of traditional people. The faces of the villagers that still followed their traditional diets were broad and their jaws had no problem fitting all their teeth. Even without toothbrushes, they were able to largely resist cavities. I think that this really shows how deeply diet affects us. Many already know how diet holds a relationship with disease, but few understand how it even affects how our body grows. In the coming future I’ll be writing about what Dr. Price called physical degeneration. Most of the time, when one either tries to plan a healthy meal for themselves or their family, or is given a healthy recipe in some popular fitness/health/food magazine or website, focus is given almost entirely to numbers. Numbers like grams of fat, calories, cholesterol, and fiber seem to dominate people’s minds when looking for a healthy meal. There’s a major problem in this equation, however: it’s just not healthy! Yes indeed, there is more (much, much, much more) to healthy eating than numbers. The number one thing to consider, is quality. As a health coach, I never pay attention to the numbers; instead I read the ingredients to see if there is anything in that specific food that will be harmful to me. Of course, it’s best to just plain avoid anything in a package, but that doesn’t happen over night and some people just plain aren’t interested in making everything themselves. Let’s make this real simple and go straight to the recipe. Here is a recipe I found on Eating Well Magazine’s website. It’s low in calories and supposedly heart healthy and good for diabetics and those looking to lose weight. Low in total fat, low in calories, low in sodium, and simple ingredients; what on earth could be wrong here? Let’s start straight from the top. Firstly, I am seeing no suggestions are far as buying organic goes. But just to give Eating Well a small leg to stand on, I’ll assume that they actively encourage their readers to buy organic products. What’s the big deal? Well, for one there are no synthetic ingredients that are known to be cancerous. Secondly, there have been a number of studies showing that pesticides are triggers for a number of diseases. You can drink all the skim milk you want, but if it’s got growth hormones, then you’re increasing your chances of getting cancer, and the lack of vitamin A & D (which are found in the fat) isn’t good either since they help protect against cancer (and a number of other pathologies). Lastly, cholesterol is needed for the body to help synthesize vitamin D, so even if one is consuming other foods that may be rich in vitamin D, you still want the dietary cholesterol to help keep your body from being deficient. Goodness, this is just one single ingredient. Can you imagine what the big picture is? Well then, let’s continue. As mentioned previously, reduced-fat dairy products are refined foods. If it’s pasteurized, the nutrient content will be minimized and the homogenization will increase the chances of heart disease. Even if it’s organic, reduced-fat products are nutritionally useless, and they can even lead to weight gain, as studies have shown. It’s safe to assume that the animal products that are used in this recipe also don’t come from pastured animals. You see, most farm animals are kept in barns with minimal access to the outside and they are fed not their natural diet of grass (cows) or bugs and plants (chickens) but soybeans and corn (and it gets even worse when you purchase them from a conventional grocery store). Pastured animal products are naturally lower in fat and cholesterol, have a higher nutritional profile that includes the wonderful omega 3 fatty acids. Lastly, the chicken stock used here is worthless. Even gourmet chicken stock that has added gelatin can not compare to the long-boil bone broth it originates from. Bone broths have been a nourishing tradition of a variety of healthy cultures for generations. Rich in gelatin, fat soluble vitamins, and a host of minerals, these broths have true healing properties that help to reduce bad bacteria in the gut and actually help to improve digestion. You’ll notice I removed the big fat scare with the chicken. Fat doesn’t make you fat, and neither do calories. In actuality, more fat in the diet can help encourage weight loss. Fat helps to fill you up, which means it will be longer until you’re hungry and that also means less between-meal-snacking. As I had mentioned previously, extra calories aren’t what makes us fat. Calories themselves are a useless unit of measure. I’ve heard the objections; “but if you eat 500 calories of ice cream (or chips, or candy bars, or milk chocolate, or doughnuts..), then you get fat!”. Well yes, that is true, but it’s not because of the calories. The reason is due to simple human physiology. For these foods, the extra load carbs and sugar will cause the pancreas to produce more insulin and thus will lead to inflammation and weight gain. The second thing I changed was the kosher salt. Sure it’s better than irradiated, iodized, sodium chloride (ie: regular table salt), but sea salt is a healing food that helps the adrenal glands thanks to the number of trace minerals that are found within it. What’s next? The health-supportive powerhouse of raw grass-fed butter! Yes indeed, raw butter from cows that live their entire lives on the pasture and eat only grass and hay is a nutrient dense food. Butter helps prevent heart disease, cancer, arthritis, and osteoporosis, it helps support the thyroid and digestion, and it contains 13 different fatty acids, including stearic acid, arachidonic acid, and glycosphingolipids! Butter contains a perfect 1:1 ratio of omega 3 to omega 6, which is good for the heart. Lastly, butter is a super-rich source of vitamins A, E, & K2, selenium, lecithin, iodine, and the Wulzen factor! But wait, butter is a saturated fat, isn’t that terrible? The science is out, and it has shown unanimously that saturated fatty acids are in no way correlated with heart disease. In fact, saturated fats help prevent heart disease by lowering lp(a), a known risk factor. As I mentioned previously, there is a stark difference between the chicken-flavored water that you can pick up at the store and real, traditional, nourishing bone broth. Not only is bone broth incredibly nutritious (in addition to butter, I suggest making bone broth a dietary staple), but the flavor is astounding. Use it in a sauce or gravy for your favorite meal and you will notice a dramatic difference. The flavor is incredibly rich and it really makes a dish. It’s very easy to make (all you need is some aromatic vegetables like celery, onions, carrots, parsley, and cilantro, a pound or two of chicken bones, and a stock pot), especially if you cut up the vegetables ahead of time. There is another load of fat with the raw sour cream. Isn’t this too much? Heck no! This of course beats the pants off of typical store-bought sour creams in that it’s loaded with the fat-soluble vitamins (A, D, E, K, and K2), a great source of omega 3 since the cow ate grass, and it’s properly fermented (instead of just made sour) to ensure it not just goes down easy, but it contains wonderful probiotic bacteria as well (on top of the beneficial bacteria that’s already found in raw, unpasteurized dairy). Mustard seed use for food and for healing dates back to antiquity. In China during the Tang Dynasty, it was used to treat lung diseases. The Egyptians used mustard for “respiratory therapy”. In the Middle Ages mustard was used for respiratory ailments such as chest congestion, coughs, and asthma. Eighteenth century English physician Herberden endorsed mustard seed for the treatment of asthma. Mustard is a cousin of cabbage and broccoli. During grinding the mustard seed contains sinigrin, and releases sulfur compounds and oils. The odor irritates the skin and mucous membranes. All the more interesting that mustard seed has been used all over the world for treating the sinuses and lungs. Looking at these two recipes, which do you think nourishes the body more? Which do you think matters more? A paper-tiger chase of fat, sodium, and calories, or helping the body heal and encouraging wellness? Which do you suppose is more like how our ancestors ate, during a time when there wasn’t epidemics of disease and obesity? A while ago I talked about conventional dairy, and the problems associated with it. However, Dairy in itself is a hot issue in the world of nutrition. Pro-milk groups claim that the calcium in milk helps to prevent osteoporosis, while Anti-milk groups claim that studies show that milk actually causes osteoporosis. There are many holistic nutritionists who are very much against milk, and others that say it's great for you. This type of confusion is very common in nutrition, sadly, because studies that are done do not indicate important specifics such as milk type and the ethnic diversity of the participants in the study. Milk has a bad reputation among many modern Western health advisors because most people already have an overabundance of mucus and are overweight as a result of their excessive consumption of meat, sugar, fat, and dairy. Furthermore, having lived all their lives on these highly mucus-producing foods, many have developed digestive weakness and are consequently allergic to dairy. Inherent in some allergies is an inability to digest milk sugar (lactose). "Lactose intolerance" is prevalent among Asians (80% of the population is lactose intolerant), African/Black Americans (70%), Mediterranean peoples (60%), Mexican-Americans (50%), and anyone whose ancestors did not consume dairy foods. Conventional Milk: The average stuff that can be found everywhere. This stuff is nasty and should never be ingested by anyone! Not only are the present pesticide residues outstanding, it is also treated with RBGH growth hormones, the cows are pumped full of antibiotics and are kept in horrible living conditions. A great resource to understand this is the Meatrix cartoons; specifically, The Meatrix II: Revolting. “All Natural” Milk: All Natural means that it's minimally processed, uses less pesticides, and is without the repugnant RBGH hormones and antibiotics. This is better than conventional milk products, but not ideal. Pesticides are not good for you at all; they reduce vitamin content in foods and lower our immune systems. Certified Organic Milk: This is much more ideal than the previous types of milk. Organic milk has about less than 1% pesticides, no RBGH (although some companies will use legal loop holes and still claim that they sell Organic Milk. Read about it here), and no antibiotics. Unfortunately though, due to FDA regulations, Organic Milk is not perfect. All commercially sold milk products must be homogenized and pasteurized. I'll explain these processes briefly. Raw Milk: This is how our ancestors consumed milk, in its natural state. Raw milk contains no pesticides, antibiotics, or growth hormones and it also does not go through the process of Pasteurization and Homogenization. Raw Milk is the healthiest of all, but no thanks to FDA regulations, it is illegal to sell in almost every state (California, Connecticut, Maine, New Mexico and South Carolina are the only states where you can find Raw milk in a store). But you can still obtain Raw milk directly from farmers and RealMilk.com has put together a comprehensive list for each state for where you can obtain Raw milk if you so choose. Among all wild mammals, milk is reserved for the newborn, and no other animal drinks another animal's milk. However, this does not mean that the adult human is necessarily wrong to use dairy; we do many things unique to our species. It is our feeling that milk products should not be a main feature in any diet beyond the infant stage, but are best used as a supplement, provided they are well tolerated and of good quality. One small aspect of animal dairy that is not mentioned much is that of dairy from Goats. Goat's milk is great for those that want to consume animal dairy but either have issues with deficiency or have problems digesting cow's milk. Since a Goats diet consists of leaves, grasses, and herbs, their milk contains many nutrients that cow's milk does not. Now of course, there are those who simply can not digest milk from animals well, or those who wish to abstain from animal products for moral reasons. There is nothing wrong with not consuming milk from animals. The most common sources are Soy milk, Almond milk, and Rice milk. Out of all the beans, soy is the most difficult to digest. After wheat, soy is one of the most common allergens, and people don't realize this because it is labeled as a health food. Remember, just because it's sold in a natural food store, doesn't mean that it's healthy. Raw almond milk is both delicious and nutritious. While it doesn't have the protein content of animal milk, it's rich in plant-based fats and various anti-cancer phytonutrients. Once you make a batch, you'll need to drink it within a day or two, since it tends to sour very quickly (it's alive, raw and nutritious, obviously), but I've found that you can preserve it in the refrigerator for several days longer by adding a couple of drops of food-grade hydrogen peroxide. Your best option with Almond Milk is to make your own of course, as Mike Adams hints. Here's an easy 5-step process to follow. One thing to be cautious about with Raw Almond Milk (and thus Raw Almonds) however is that recent legislation passed now says that Almond Milk that has been pasteurized can still be labeled as “raw”. You can learn more about this in Mike Adams' article on NewsTarget.com. Lastly, we have Rice Milk. Unfortunately, almost no information exists on this. I've spoken with health professionals, scoured through my library, and have looked through the Internet to no end. The only information I can really provide is that Rice Milk is supposedly pure carbohydrates, this means that it's great in the morning or in the afternoon, but you may want to shy away from it in the evening because your body may not be able to burn off the carbohydrates since we usually are very relaxed in the evening and do not need the extra energy. I've seen a few “healthy” recipes here and there that call for Rice Milk as well. Bottom line: Buy it organic or raw (or see about making it yourself! ), and see how your body responds to it.